Activia, the famous yogurt, is now organizing a new contest to celebrate its 10th anniversary in Canada. 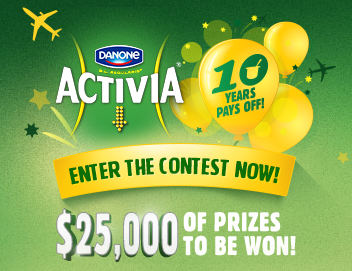 The Activia 10 Years Promo Contest is on now. Participate at Activia.ca/10yearpromo today! Why is it worthwhile participating in this contest? Well, it's obvious - there is $25,000 of prizes to be won. The odds of winning are good: there are 100 $200-value gift cards from Indigo, HomeSense, Winners at stake... Plus, there is a grand prize: a trip for two valued at $5,000. Even if the contest ends on November 30, 2014, don't delay your participation. Visit Activia.ca/10YearPromo and sign up for the contest. As easy as that!